The best thing about Gazeara is that everyone shares everything. The worst thing about Gazeara is that everyone shares everything. Gazeara is the largest communist society in Cimmeria with over 25,000 people. No one in the city need worry about food, shelter, or safety. The government takes care of everyone’s basic needs, but restricts their activities beyond that. This restriction is accomplished through a massive amount of scrying dweomers on the city streets and in people’s homes. If an infraction of the rules is detected the police can find that person later to arrest them. Originally Gazeara was a monarchy, but over a hundred years ago a tyrant, King Shardamar, took control of the small kingdom from his benevolent father. King Shardamar established the scrying dweomers to stop crime, but later used them to stop treason and dissent. As people realized what he was doing they revolted. King Shardamar put the revolt down with a hired force from Phoenix. When King Shardamar’s incompetent son, Shardamar II, took the throne he was unable to satisfy the people’s demands and unwilling to sacrifice his wealth in order to hire the necessary force to put down a revolt. After his deposition the citizens of Gazeara elected a new leader, Leopold Anigama. Anigama has ruled for three and a half decades, faithfully following the public’s original mandate of making everyone equal. Gazeara’s communist form of government led to war with its monarchical neighbor, Xoria. The large militia force allowed Gazeara to fend off the Xorian Empire’s forces prior to the formation of the First Alliance. In the war of the First Alliance, Anigama was slain by the leader of the Seven Rages, Grave. Without their leader the people of Gazeara were unable to rally. After the war they were subjugated by the Xorians. While the Xorians ruled the city, they could not change the cultural conventions of the Gazearans. The ideals of communism persisted, leading to many minor revolts that were put down mercilessly. The trend continued when Jevaninada II took control. Unfortunately for the king, while his army was away fighting in the Battle of Phoenix, Gazearan rebels opened the gates of the city and allowed the Rebel army inside. Jevaninada II sent the Amazons back to siege Gazeara. They have surrounded the city which is now led by Major Dactirian of the Rebels. Gazeara is a port city built along the shore of the Caspian Sea as well as along the banks of the Great Divide. The city is built in a traditional style with various farms and orchards surrounding the walled interior where commercial shops can be found. Ships launch from the harbor daily to find pearls, and to catch fish and urchins. 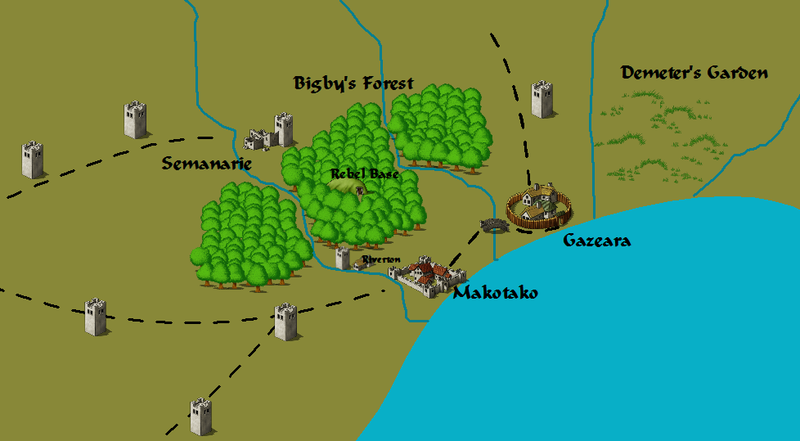 Bigby’s Forest is nearby and the citizens hold hunts there on festival days with the permission of the Elves. The professions of the town are given respect according to what they deserve, but none are given more to eat than any other. Before King Shardamar II was forced off his throne he used his wealth to replace the fountain outside the royal palace with a massive, immortal flame. The flame was placed on a three foot pedestal with a ten foot radius. The whole construction is called the Great Fire. The fire was meant to be used to offer sacrifices to the gods during special ceremonies and to always light the way to the palace for those who wished to find it in the city. Shardamar II and his family were executed by being thrown into the Great Fire soon after it was created. Anigama executed other traitors and spies with the Great Fire and now all capital offenses are carried out via the Great Fire. Logan of Gazeara is a powerful warlock who attained his power via extensive study of the Great Fire. When his research was complete, Logan went to the Fire at midday and performed a secret ritual. He was gifted amazing power, but at unknown cost. Logan went on to join the Adventurers’ Guild of Phoenix and participate in the Battle of Phoenix. After the Battle he went to Jipangu to train new recruits in the army, but upon learning that Gazeara had been freed from Xorian control by the Rebels he quickly traveled to the city to assist in defending his homeland and its culture. Speaking of Gazeara’s culture, ridiculous is the word most often used by outsiders to describe it. During his life people worshiped Anigama as an immortal even though neither of his parents were immortals and that has continued into the afterlife. Anigama is present in the city’s art even more often than Zeus. A popular image is the communist dictator battling Shardamar II for the crown on top of the royal keep. Art that doesn’t pay homage to Anigama is simply seen as inferior. There was a time when art that did not feature Anigama was burned in the Great Fire, but that practice has thankfully gone extinct. The church and clergy of Gazeara functions like a tax collection agency. The people pray to Anigama and the Olympians for help in battle, to accomplish a daily task, or to save a sick relative. On holidays during his lifetime Anigama would speak to the people and perform miracles such as lifting the royal castle up from its foundations and putting it back down or causing the sky to pour down rain one minute and sunshine the next. Reenactments of these events continue today on religious holidays. Outsiders who visit Gazeara are stumped as to why Zeus lets these people survive with their daily blasphemies. A number of strange customs have been created since the revolution. When someone tells you they like something that you own, it is socially necessary to give your possession to that person. You may then say you like something back, but not the item you just gave to that person. In the evening the people of Gazeara climb ladders to their roofs to watch the stars come out and talk with their neighbors. Gazearans also eat their food with tiny silver weapons they call utensils. Gazeara has an amazing city layout well-suited for defense. Food can be imported by land, river and the sea making the city almost impossible to siege. The city design of Gazeara includes several walls and traps for the unsuspecting invader. The keep itself is a well built stone castle, but the real strength of Gazeara lies in its people. The Gazearans love the freedom they took from Shardamar and will never surrender to another monarch. The first invasion of Xoria was turned back by farmers, women, and children fighting with pitchforks, butcher knives, and walking sticks while they rode on goats and mules. The free education Gazearans receive teach them sound strategies to use incase of an invasion and give them the mental strength to never give in to tyranny. A visitor to Gazeara has little to no hope of having a good time. There are a few sights to see, such as the castle, the central garden, the Great Fire, and the military museum, but none of them are worth the price. Any visitors must show proof of being a diplomat or be on a mercy mission or else they will fall under Gazearan tax laws. All of their magical items are forfeit upon entry to the city and not returned under any circumstances. Those who refuse upon stepping through the gates are tried for treason and quickly sentenced to death. If a tourist actually wants to stay for a few days they will find that failure to follow Gazearan customs leads to quick social ostracism.